Anyone can clean their windows, but the question is are you doing it properly? Windows not only provide light and ventilation, they also add elegance to the structure of the building. To maintain their beauty and looks, they must be cleaned and maintained regularly. However, window cleaning is not as easy as it looks. 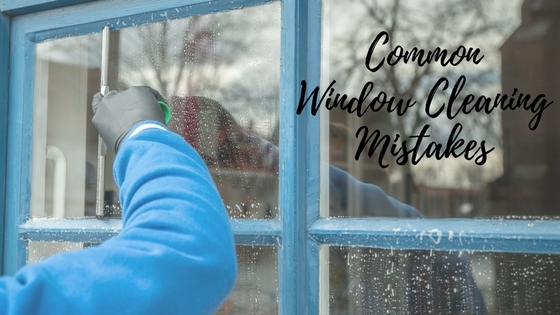 Common window cleaning mistakes can easily be made which makes it an unpopular task and often gets to be at the bottom of the priority list. Just because the lady on the advertisement says that their cleaning cloth is the best does not necessarily mean that it is. Avoid abrasive materials that may scratch or damage your windows permanently. Remember that old cleaning myth about using newspaper to clean the windows? Newspapers contain harsh chemicals not to mention much ink which may cause more damage than good. A soft microfibre cloth or a squeegee works magic. Looking at the window straightforward is not enough. It may look bright and be sparkling that way but take your time and try to look at it from different viewpoints/angles. Chances are there are still streaks and drips left. Having Mr. Sunshine out all day may seem like the perfect time to tackle your window cleaning duties but remember that when it is too hot, the heat will cause your window to dry too quickly and will leave streaks and stain from the cleaning solution. Choose a moderate day when the temperatures are cooler. Lifestyle Cleaning Services years in the industry has given us insights on what works and what doesn’t. We clean all types of windows and glass-like surfaces for both residential and commercial properties. Using our special pole brush system, we can reach up to 5 stories with no ladders required, which saves you on labor costs. We also use our water purifier system, which means your windows will dry clear and no chemicals are needed. By having your windows professionally cleaned on a regular basis you can reduce your power bills. Plus, clean windows mean a better view.